This section is from the book "A Manual Of Home-Making", by Martha Van Rensselaer. Also available from Amazon: A Manual of Home-Making. Simple rectangular shapes for rooms are the natural outcome of building conditions. Any extension or projection should be a coherent structural feature and should be used only to satisfy a need in the function of the room. A chimney seat, a recess necessitated by a dormer window, an ingle nook when it works out naturally on plan, are often reasonable features. A bay-window built to add space or to improve the lighting conditions of a room, if well designed may furnish an interesting decorative feature both inside and outside the house. No excrescences or protuberances should be built merely for the sake of original or ornate effect. Fig. 13. 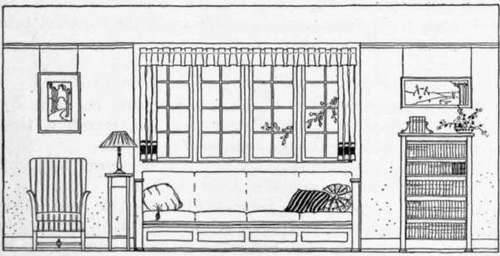 - A typical low room in an old-fashioned cottage, showing how even a good horizontal arrangement of lines and furnishings decreases the apparent height of the room. Fig. 14. - The same type of low room as in Fig. 13, showing how a vertical arrangement of lines and furnishings tends to increase the apparent height of the room. An oblong is in general a more pleasing shape for a room than is a square. A pleasing relation between the three dimensions - length, breadth, and height - should if possible be maintained. A room that is very long is not easily adapted to general uses and is lacking in an effect of intimacy. A room that is too high is wasteful of unused space, is hard to heat, and is unfriendly in appearance. In a room in which all the dimensions are equal or nearly equal, the shape is obvious at once; nothing is left to the imagination, and the result is stupid and uninteresting. However, a square may sometimes be the most convenient and economical shape for a room. For a small dining-room with a square or round dining table, a square may be both a convenient and a fitting shape. An oblong in which one dimension is perceptibly longer is much more pleasing than one in which there is a doubt as to comparative dimensions. An excellent proportion for an average room is one in which the width is more than half and less than two-thirds the length. In a house of moderate cost and size, it is not always possible to plan so that each room is of ideal proportion. Persons must often live in homes which they themselves have not built. In such cases there are many devices by which the apparent pro-portion may be improved. Devices for changing apparent proportion (Figs. 13-16). The eye naturally tends to follow any continuous line. By establishing lines in any particular direction, therefore, that direction is emphasized at the expense of the others. 1. By bringing the ceiling color down on the side wall. This is successful only when the ceiling color is happily related in hue and value to the side wall, and when its width corresponds to the width of a moderate border 10 inches or 12 inches, in a room of ordinary dimensions, say 14 feet by 16 feet by 9 feet. Fig. 15. - A tall room of the late nineteenth century type showing a placing of picture molding and a selection and arrangement of furnishings that tend to decrease the apparent height of the room. Wall coverings of such dignified pattern and harmonious color as are shown in Plate V, may sometimes be used above the molding with decorative effect. Note the relation of the shapes of the pictures to the spaces. Fig. 16. - A typical modern living-room in which a group of casements and a built-in seat dominate the furnishing effect. 2. By using a molding at the intersection of side wall and ceiling, and by making the picture-molding continuous with the top of doors or windows. 3. By a wainscot or dado, the top of which is on a level with the window-sills. 4. 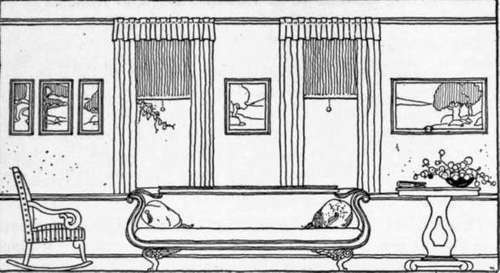 By using a valance in the window drapery, if this is consistent with the style of the room and the other furnishings, and by hanging all draperies so that the width of the opening is emphasized. 5. By using furniture in which the horizontal lines dominate, such as long low bookcases, davenports, sideboards, or tables. 6. By using pictures which are horizontal oblongs in shape, or by grouping several smaller pictures so that either the lower or upper edges of their frames will establish continuous horizontal lines. 1. By placing the picture-molding at the ceiling, leaving the sidewall undivided. 2. By using vertically striped wall paper. Stripes should always be of nearly the same color or value in order to be unobtrusive. 3. By using as long draperies as are consistent with the use and structure of the room, and by hanging these in straight folds and so arranging them as to make the openings high and narrow in effect. 4. 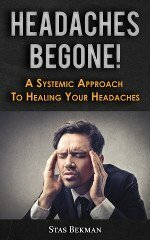 By the use of tall and narrow bookshelves, cabinets, and other furniture. 5. By the use of pictures that are vertical oblongs, or by grouping the pictures with each other or with pieces of furniture so that the vertical is emphasized. 1. By opening up a vista through a door or window, or by planning interesting features in the furnishings in order to emphasize the long axis of the room. A mirror may perform a valuable office in adding to the apparent length of a room. The French have understood this and have increased the apparent size of dance-hall and dining-room by the skillful use of many mirrors. A study of windows in relation to the adjoining wall space. 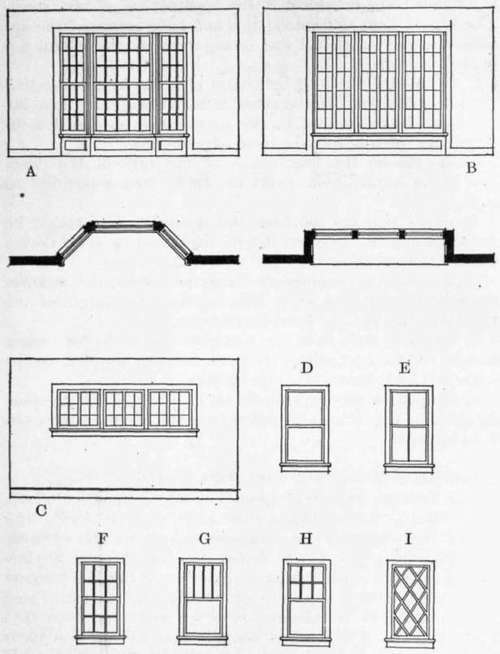 First group: A single window in the middle of a short wall: a small double-hung window of bald design; a generous double-hung window with pleasing wall space around it; an interesting and well-placed casement. 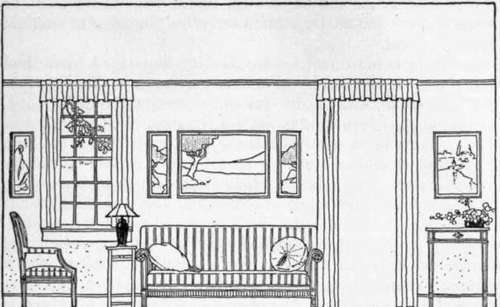 Second group: Two separate windows in a generous wall space: a good arrangement both for distribution of light and for the placing of furniture; a poor arrangement both for lighting and for furnishing. 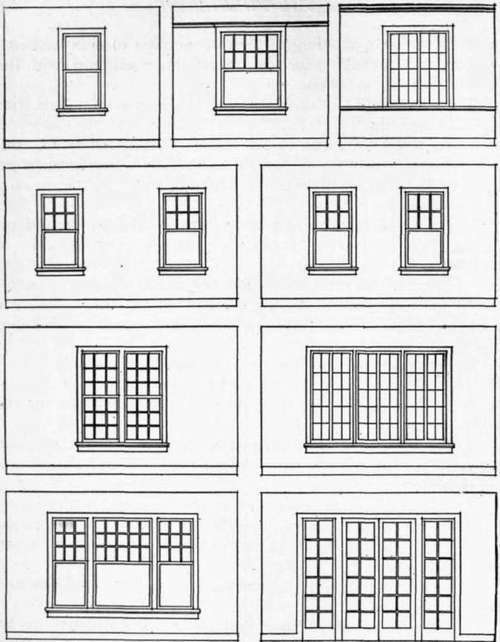 Third and fourth groups: Pairs and groups of windows in a generous wall space: a fair arrangement for a pair of double-hung windows, providing good light and good wall space; an interesting group of casements, dominating the wall space and furnishing abundant light; a pleasing group of double-hung windows; a pleasing arrangement of French windows. The use of moldings in any case must be related to the proportion of the room and the structural line of the openings. 2. By placing the long dimension of a rug in the direction to be emphasized. If the room is sufficiently large and the other conditions warrant it, two narrow rugs so placed as to emphasize the length of the room may be used. 3. By placing the long pieces of furniture in the direction to be emphasized. Seats or shelves may sometimes be built in. 1. By placing openings or important structural features centrally on the long sides, thus breaking the length of the room into two or more furnishing centers. 2. By using more than one rug, placed with the long edges parallel to the short side of the room, in order to break up the space and establish lines across the room. 3. By placing the long pieces of furniture or by grouping furniture so that the width rather than the length of the room is emphasized. Location of windows and doors (Figs. 17, 18). The location, style, and proportion of windows and doors are structural considerations that affect every interior. The amount and shapes of the remaining wall spaces after windows and doors have been placed define the possibilities of the furnishing scheme. It is, therefore, important to arrange windows and doors in such a way as to leave usable wall spaces. These spaces should be so pleasing in shape and proportion that the bare room is in itself a design. Many doors in a room are an evidence of poor planning. While there is no rule about windows, an amount of window area equal to about one-fourth the floor area will in general be found a reasonable guide. Fig. 18. 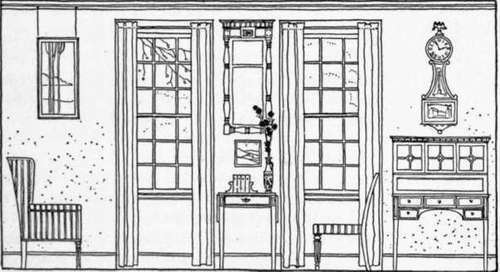 - A-B: Two types of bay windows. C: A well-placed group of high casements. D-I: A study of six windows showing how the appearance of the window is affected by the division of the glass.